Part of the reason for setting up this new website, is to find ways to demonstrate and help explain my images. So I have been experimenting with ways to do this and this is the first post along these lines. I plan to considerably expand the About page, but in the meantime, this is a quick summary of the main parts to these illustrations. I hope to go into each of these more fully later. 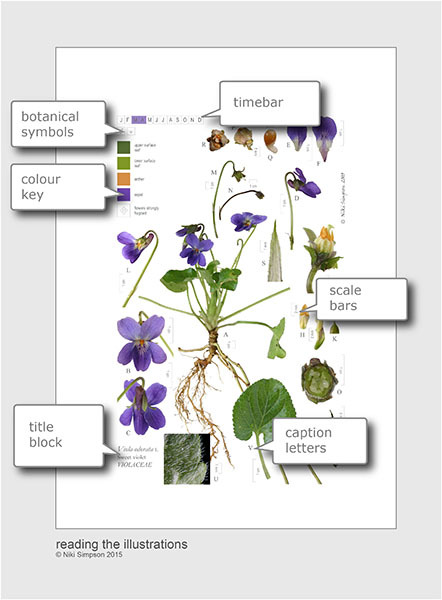 Features like the title block, scale bars and the lettered parts are long standing conventions used in published botanical illustrations and will not be new to botanists and those used to looking at botanical illustrations, but the colour key, timebar and botanical symbol set are new features which I developed and designed during 2005 – 2006, specifically for inclusion in my digital images. The title block, usually in the bottom left hand corner, contains the currently accepted Latin plant name, with the author for that name, together with the main past botanical names, or synonyms. I have also included the most well known common or vernacular names, and lastly the botanical family in which the plant is placed. The colour key, in the top left corner, shows standard colour references for notably coloured plant parts. For this I have used the RHS Colour Chart which has been specially developed for recording plant colour. The timebar, again in the top left, shows a lettered block for each month of the year; those coloured indicate the month/s of flowering. In the violet example shown, it can be seen that the species generally flowers March – April. Botanical symbols are used within each image to convey the sexual arrangement, life form and various other features of the plant, such as smell and toxicity, that are otherwise difficult to depict. For example, in the violet illustration shown above, the botanical symbols indicate that the plant depicted is a non-woody perennial, is hermaphrodite and has scented flowers. For the key to the full botanical symbol set, go to Symbols. All parts and dissections are shown to scale by a metric scale bar. Traditionally measurement information was often included by using a multiplication sign for the number of times the part was enlarged, for example ‘x3’. However, for digital images, viewed onscreen, using scale bars means that, at whatever size the image is viewed onscreen, the scale bars are accurately rescaled automatically. A: flowering plant showing stolons, normal flowers only; B: flower, front view; C: flower, back view showing detail of calyx; D: flower stem with paired bracteoles, side view of flower; E: upper petal; F: central lower petal, G: flower detail, petals cut away showing androecium and gynoecium, etc.